I don't know about you, but I find it hard to get a good, hot, gluten free breakfast that doesn't take forever. I mean pancakes are great and all, but they're not exactly quick. And the other morning I woke up and it was chilly and raining and I had a cold. Which is funny, because right now it feels something like 30C! It's totally summer weather! This quinoa breakfast bowl is great because it's super flexible, you can make it a bit different each time, depending on what's in your cupboard. Mine was very simple this time around, but I've made a similar type of gluten free porridge using millet flour in my book Living with Oral Allergy Syndrome. This one is equally as easy and equally flexible. This recipe is also very quick and easy to make. Double it and refrigerate it to eat throughout the week. Optional add-ins: raisins, dates, dried figs, dried cranberries, blueberries, minced apples, nuts, shredded coconut, etc. 1. 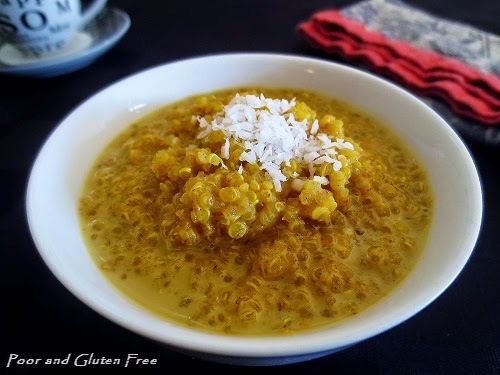 In a medium-sized pot, add rinsed quinoa, milk, water, cinnamon, nutmeg, ginger, turmeric, salt, and sweetener. If using dried fruit, I like to add it now to plump it up. Bring ingredients to a boil, reduce to simmer, cover, and let cook 15 minutes. Remove from heat and let sit covered 5 minutes. Add in vanilla and other optional ingredients and serve. 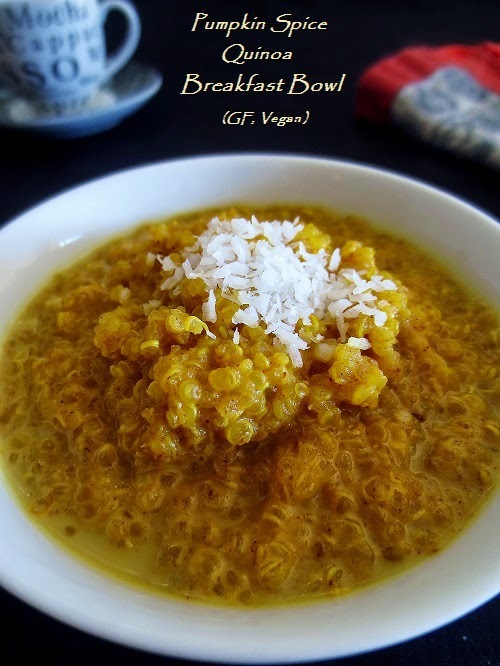 Do you have a favorite gluten free breakfast for cold mornings? Love it! Great idea to add healthy, colorful turmeric. That's really interesting. I have to confess I have no idea. I actually rarely use black pepper in anything and I can't recall seeing it in other pumpkin spiced dishes! Haha, I agree – rarely ever use it. Now I'm super curious to try it out! What a nice way to start the day! I eat quinoa regularly but never for breakfast. 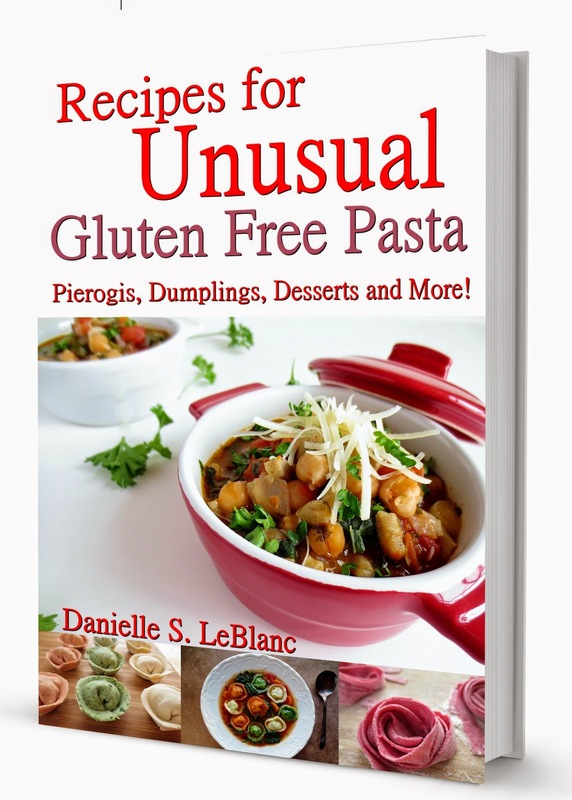 I think I'll try this healthy and yummy recipe! Thank you so much for sharing this with us at the Healthy, Happy, Green and Natural Party Blog Hop. I appreciate it! What a delicious, nutritious way to start the day, Danielle! Your Pumpkin Spice Breakfast Bowl looks and sounds wonderful. Thank you for sharing it with us at the Hearth and Soul hop.